Atlanta has a great dining culture. 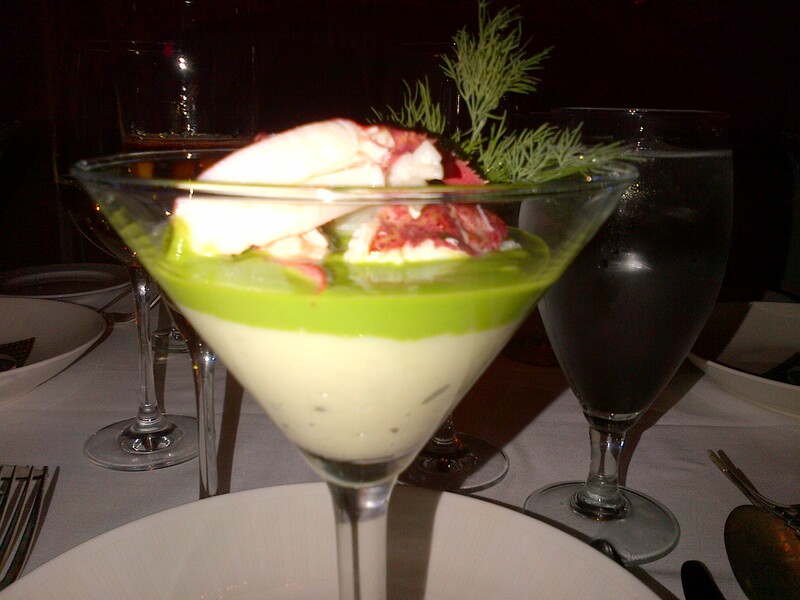 I chose Aria Restaurant for my first fine dining experience in the city and I wasn’t surprised. I expected it to be great and it was! In the stylish and happening area of Buckhead, Aria offers an upbeat and exciting atmosphere for diners. After having a kir royale in the bar area, we were seated and got down to eating. My first dish was the Warm Lobster Cocktail. The server informed us that the menu changes weekly (including the wine list) but this is one of their signature dishes that will always remain on the menu. This dish contains huge chunks of juicy butter braised lobster with a layer of broccoli mousseline on top of a layer of black truffle potatoes. This is an INCREDIBLE dish. (Remember my favourite things?) After every bite, I was humming on the inside because I enjoyed it so much but I felt like singing. It was that good. For my main, I ordered the pistachio encrusted trout with crab smashed potatoes and snow peas. The trout was perfectly seared – crisp on the outside yet still moist on the inside and gobbled up the crab and potatoes. Yum, yum, yum. For dessert, I ordered the warm chèvre cheesecake with poached pear (no whip cream) and 4 candied hazelnuts. You know, I’ve never had cheese cake before because of my lactose issues. To be honest, I’ve never tried tiramisu or creme brulé as well. Over the years, I’ve had to educate myself about what dairy I can tolerate and found out that certain cheeses don’t have as much lactose as others – hence my love of goat cheese. So how was my first bite? It was really good but I wasn’t head over heels. This is not a negative. I would definitely return to this restaurant as they have a popular foie gras appetizer I need to try. Also, the service was professional and very friendly. I like it when the server knows exactly what is on the menu and makes informed recommendations but isn’t snooty when you ask questions. But what really puts this experience over the top is dining with the right company. It was definitely a memorable dinner. Thanks guys!